What are the most effective wear resistant coatings for light alloys? Light alloys have become indispensable within a huge variety of industries, from the performance-focused automotive and aerospace industries, right down to the cost-centric industrial sector. But the transition from heavy metals to light alloys was, and still is, far from seamless. Engineers have faced a recurring set of issues when switching to a light alloy. One of the major challenges for industries which encounter wear is that, despite their favourable strength-to-weight ratios, lightweight metals tend to have low hardness and exhibit poor resistance to mechanical wear. This makes surface engineering and advanced coatings critical to their industrial use. What coating characteristics are required to improve wear resistance? Wear resistance is an umbrella term used to refer wear in all its forms, including impact, fretting, abrasion and friction. Traditionally, it was believed that increasing the hardness (H) of a component’s surface would provide better wear resistance. This is true in part, but a level of compliance is also very useful to mitigate fracturing. As such a more useful indicator as to whether a coating will be hard-wearing is the ratio of its hardness or tensile strength to its stiffness. A second important property is lubricity. Coatings with a low friction coefficient reduces the energy and material transfer between the two parts, reducing the likelihood of damage. PEO coatings have a high lubricity and can be lubricated further with additional topcoats to lengthen the life of components in these strenuous conditions. For some applications, the coating may need to increase the material’s load-bearing capabilities. This is often the case with lightweight metal substrates, whose low yield strength may not otherwise support the Hertzian stresses provided by the wear partner. To achieve this you can apply a very thick coating or increase the strength of the base metal surface itself by diffusion of secondary elements into its lattice. Hard anodizing provides a very good wear resistant coating for many applications, especially as moderating temperatures and processing times will help form harder and thicker protective oxide layer, depending on your need. Anodising boasts hardness two or three times higher than light alloys such as aluminium and its fine columnar microstructure produces a smooth surface with low friction. Hard anodised coatings are best suited to applications involving intensive heat, but not necessarily those involving heavy loads, as the coating typically has vertical cracks that reduce the fatigue strength of the metal. The limited aesthetic effects also minimise the applications for hard anodised metals, while the technique is not available for magnesium and titanium alloys in any case. Nitriding is a popular hardening heat treatment with a hard, slender protective layer that is achieved by thermochemically introducing nitrogen to the outer surface. One challenge that all nitriding methods face are the high temperatures (typically above 540ºC) that the process requires. As such, nitriding is only realistically suitable for use on titanium. Even then, the possibility of thermal distortion must be considered. Due to the plasma discharges, crystallites of high hardness are formed in the coating, offering an attractive combination of high hardness and low stiffness – perfect for high fracture toughness, high adhesion and hence wear resistance. However it is the green credentials of PEO that are really creating a buzz. Coatings are free from toxic byproducts and free from chromium, which mean easy REACH and RoHS compliance. The combination of excellent wear and corrosion resistance, combined with a clean application process, ranks PEO amongst the most promising scalable surface treatments to emerge in the last 30 years. Electroless nickel (EN) plating is perhaps the most popular and effective type of chemical or plating for aluminium and titanium. It involves deposition of an Ni-P composite in a chemical bath, producing coatings of excellent uniformity that possess high hardness, natural lubricity, ductility and good wear and abrasion resistance. Additional wear resistance can be conferred by the inclusion of silicon carbide into the coating. Good quality EN can be problematic to apply since the cleanliness of the surface prior to application is critical, and any surface contaminants may prevent plating. Similarly this cathodic method will cause rapid corrosion if the coating contains any pores or breaches. This was a common cause of failure on cast alloys, causing it to be abandoned as a widespread coating for cylinder liners in internal combustion engines. Choosing the right coating for a component in a testing environment is always important. For this reason, selecting the right material and a coating as one holistic decision is always likely to produce better results. One of the major benefits of advanced surface coating technologies is that they are adaptable. Plasma electrolytic oxide coatings are created over three distinctive stages, each of which creates opportunities to uniquely adjust the processing parameters to create bespoke coatings for the precise needs of the application. 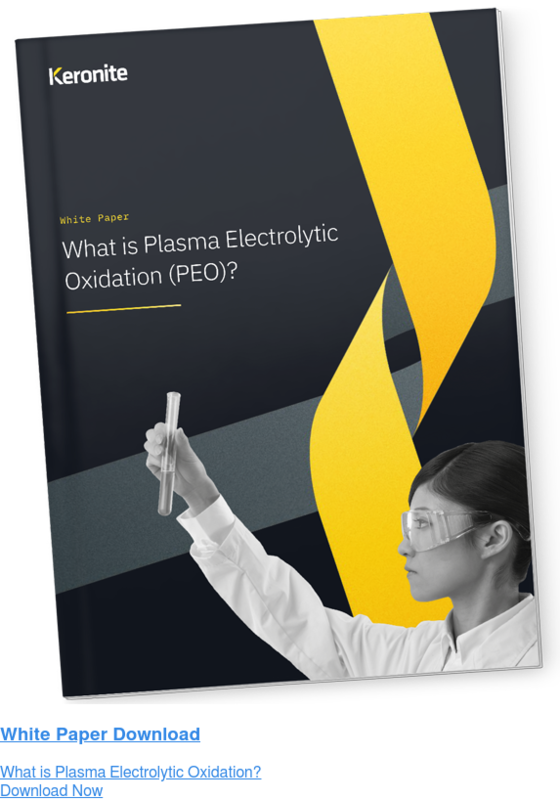 You can learn more about plasma electrolytic oxidation in our free white paper, or, if you are interested in exploring the capabilities of the technique in your industry, get in touch with us today.